Sports sponsorship is nothing new to Intel as they have sponsored the BMW-Sauber Formula 1 team before and several eSports teams throughout the world. However, I would say that the latest round of sponsorship that the well-known chip maker have officially announced just moments ago is slightly different though. This is due to the fact that the organization that Intel have agreed to sponsor is one of the most well-known football team in the word: FC Barcelona, fondly known among football fans as Barca. Yup, it is the Spanish team that have just visited this region including Malaysia few months ago. Through the deal which estimated to be worth around USD 25 million (RM 80.76 million), Intel is now officially FC Barcelona new technology partner. As part of the deal, Intel will be working together with Barca to provide latest Intel-based tech at La Masia – the club’s well-known youth academy. Additionally, Intel will also be supplying 2-in-1 devices to Barca’s players and coaches while helping the club to improve its research, training and performance at the same time. Both of the partners will also be working together to provide better fan experience at Camp Nou, Barca’s home ground. Last but not least, Intel will also be involved in delivering latest technology to Barca’s education network all over the world. Another interesting part of the deal is that Barca jersey will now feature Intel Inside logo but not at a spot that one might expect. Instead, the logo is located inside the jersey itself which is never been done before by the team. Barca will be utilizing the jersey with Intel Inside logo starting from this weekend onwards in the 14 December’s La Liga match against Villareal. 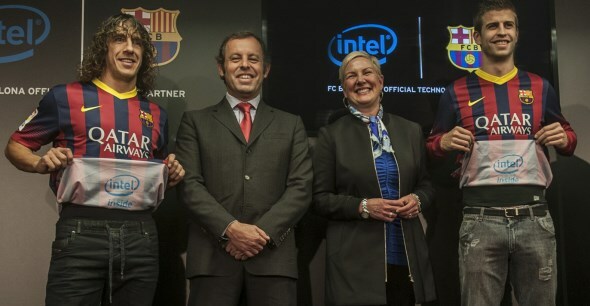 This partnership between Intel and Barcelona can be taken as an example on how tech companies are able to help sports organizations and athletes not only in terms of financial and marketing support but also help them improve technology. I hope it would inspire tech companies in Malaysia to consider embarking in such initiatives with local sports association, teams and athletes.